High density inventory management system in a medium security vending machine format. Manage batteries, flash lights, safety supplies, cutting tools and fasteners with the push of a button. People love the AutoCab because it can store almost anything. The transparent see-through windows provide an easy view of items, and you can issue exactly what you need with the touch of a button. 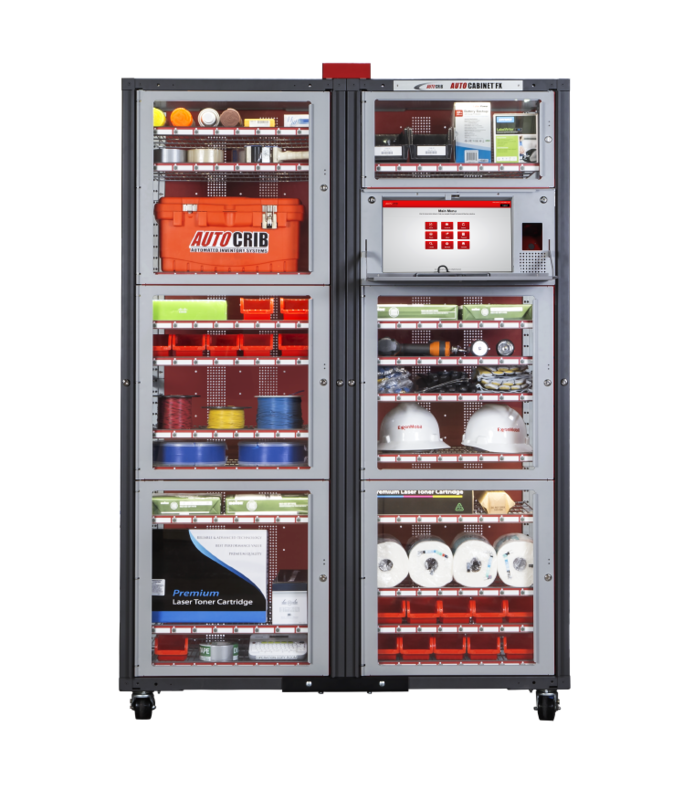 This high density automated tool locker can provide secure access to over 200 different items through a variety of drawers, bins and cabinets through its inventory control system. Reduce consumption by 20-40% or more, prevent stock out situations, and improve your inventory forecast accuracy. AutoCrib® lets you identify the root causes of your inventory problems, and actively prevents them from happening in the first place! The AutoCab inventory management software can even automatically handle purchase orders. AutoCab removes the labor intense burden of inventory management so your employees can focus on what they do best - added-value production and working with customers. Anytime you repackage, or have someone else repackage, it adds to your costs. With the AutoCab, you will never have to tediously repackage your items. You can place your inventory straight into in the industrial machine and not have to do anything special with the packaging. The AutoCab is a very flexible high-volume asset management system with a compact footprint. It has 6 zones that give you compartment-level control with re-configurable shelves or optional sliding doors. So, it’s easy to manage a wide-variety of items that are large or small in a single industrial machine. It works great with expendable inventory like carbide inserts, safety supplies, batteries, welding tips, spray cans, and general MRO items. It also is good for durable items such as air tools, cordless drills, flash lights, and toolbox kits. It’s easy to store just about anything. AutoCab establishes a level of accountability among your employees when dispensing tools, batteries, MRO, PPE, or other indirect material and industrial supplies. The flexibility, high density, and wide-versatility of the AutoCab inventory control system will allow you to achieve a level of control over your inventory near your work areas instead of having to store them away from employees. This reduces walk-time and long waits for items which will improve your productivity. .
It’s nice when you can see your inventory, we think you will agree. That’s why the AutoCab has clear see-through doors and side panels, so it’s easy to see everything in your tool locker. The AutoCab also has a touch screen and keyboard making it easy to search for anything you want too!